Los Angeles is the United State’s second most populated city and is home to approximately 4 million people. With a vibrant history that dates back to the 1500s. Covering 502 square miles and home to some impressive landmarks, Los Angeles sees temperatures of approximately 58 Fahrenheit in January and 74 Fahrenheit in August. When you’re visiting Los Angeles for the first time one of the must-visit destinations has to be The Hollywood Walk of Fame. Home to a large number of iconic stars the Walk of Fame may not be or as glamorous as you’d hoped but it’s still worth visiting. Venice Beach is one of Los Angeles’ most iconic places to visit. Developed back in the early 1900s the beach is the ideal destination if you like to enjoy a spot of sunbathing and people watching. With the famous Muscle Beach nearby and complete with processions along the boardwalk every day, the beach can get busy at times but it’s always worth a visit. Situated in one of Beverly Hills’ most upmarket areas, on Rodeo Drive you will find a wide range of designer stores and many boutique stores too. Feel free to take a look inside those expensive stores and see if you can spot a celebrity or two. Marvel at the very expensive cars that are parked up outside and get a glimpse of what life is like for those who call this part of the world their home. 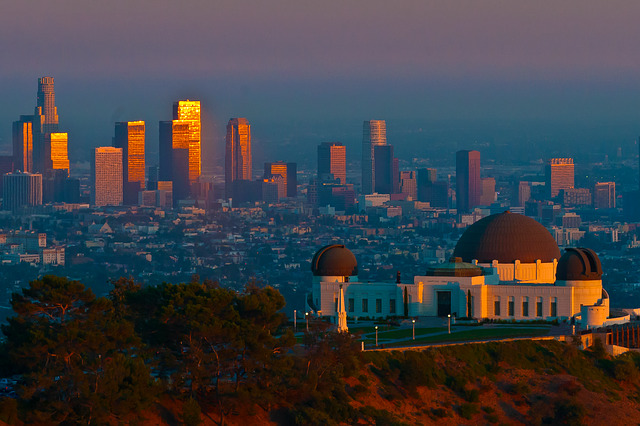 Griffith Park and Observatory is the ideal place to head to if you want to enjoy some incredible views. The Observatory is located on Mount Hollywood’s south face, overlooking the Los Angeles basin. You do not have to pay to enter the Observatory, but if you wish to see a few planetarium shows you will have to pay. If you love architecture, nature, and the hot, hot sun, a visit to the Observatory and the Park is a must. The Venice Canals can be found between the Venice Boardwalk and Abbot Kinney. A walk along the pretty canals is a must if you want to escape the busy pace of life that is Los Angeles. Gaze up at the apartments and houses that line the canal and enjoy the flora and fauna that surrounds it. If you would like to rent a boat to take you along the canal you will have to pay. If you’re happy to stay on solid ground you can enjoy a pleasant stroll along the canal as the sun shines down on you. Located in the Hollywood Hills and home to many performances by many world-famous musicians and singers, the Hollywood Bowl is the place to be. While you do have to pay for some shows there are a large number of free shows too. The sound quality is second to none and the scenery is just amazing. Pack up a picnic and enjoy it while you listen to some great music. Many locals and tourists alike happily attend a free yoga class that takes place during the week at Runyon Canyon in the Santa Monica Mountains. Walk to Indian Rock and take a 2.5-mile walk that sees you in a grassy area where you’ll find many yoga enthusiasts. Have your yoga mat with you and make sure you’re there at either 8:45 am, 10:30 am, or 2 pm. You can make a donation to the class if you wish, but it is not obligatory. So enjoy your stretch in the sunshine and breathe in the cool air as the day begins. Los Angeles is a wonderful place to visit and there is so much on offer to everyone. You don’t have to pay to enjoy yourself, so make sure you take a trip to Los Angeles and enjoy all of the free events that are ready and waiting for you.